LH-J48B lens hood is a solid metal construct hood specifically designed for Olympus M.Zuiko Digital 17mm f/1.8 Lens. The primary purpose of a lens hood is to deflect unwanted light from entering the lens and producing flare. It shades the lens from stray light, improving your contrast and image qualityIt can also provide a degree of protection for the lens from accidental impact and the elements. 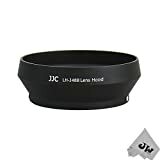 A dedicated lens hood is designed specifically for the focal length of its lens and provides enough extension to deflect light without intruding on the image frame. This entry was posted in Discount Photography and tagged 17mm, Camera, Digital, f/1.8, Hood, lens, LH48B, M.ZUIKO, Olympus, Shade by Ball Photo. Bookmark the permalink.